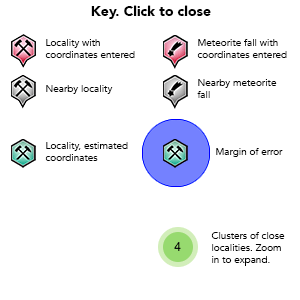 Estimate based on other nearby localities or region boundaries. No description has been added for this locality. Can you add one? Reference: Kittl (1939) Rev. min., Soc. Argentina Min. Geol. : 10: 78; Palache, C., Berman, H., & Frondel, C. (1951), The System of Mineralogy of James Dwight Dana and Edward Salisbury Dana, Yale University 1837-1892, Volume II: 1094. Kittl (1939) Rev. min., Soc. Argentina Min. Geol., 10, 78. Palache, C., Berman, H., and Frondel, C. (1951) The System of Mineralogy of James Dwight Dana and Edward Salisbury Dana, Yale University 1837-1892, Volume II: 1094.